Performance Health Biofreeze products provide temporary relief from minor aches and pains of sore muscles and joints associated with simple backache, arthritis, bruises, strains and sprains. Biofreeze Pain Reliever may be used up to four times a day - both before exercise or therapy (to relieve painful movement), and afterwards (to soothe muscle or joint soreness). Once a muscle or joint is injured, regular exercise is typically the key to rehabilitation. But when pain limits a body's ability to exercise, the healing process takes longer. Biofreeze products help break this pain cycle, by relieving pain through a method known as "Gate Control," or "gating." In the gating process, menthol acts to stimulate specific sensory receptors in the skin, thereby blocking other receptors from sending pain signals to the brain. 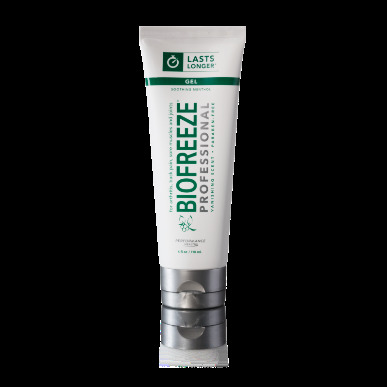 4 OZ TUBE GEL - Biofreeze Pain Relieving Gel dispensed from a tube affords the opportunity to create a more thorough experience by massaging the affected area during application. This hands-on application also reinforces touch which has been shown to be very important in the healing cycle. 3 OZ ROLL-ON - Biofreeze Pain Relieving Roll-On provides a number of unique features. The roller ball allows for product application without the need to use your hands also providing a nice massage for soft tissue wherever you apply product, and can be used in trigger point therapy. 4 OZ 360 SPRAY - Biofreeze 360° Spray delivers the #1 clinically recommended topical analgesic using the best spray technology on the market todayit works from any angle, even upside down. Its often difficult for back pain sufferers and arthritic patients to get an even application of Biofreeze where they need it most. The 360 Spray makes applying Biofreeze much easier. Like all Biofreeze products, the Biofreeze 360 Spray is paraben-free, propylene glycol free and includes a proprietary herbal blend. Biofreeze 360 Spray is colorless, uses 10% menthol and is available in a 4 fluid ounce size. 3 OZ JAR CREAM - Biofreeze Soothing Pain Relieve Cream in a 3 oz jar penetrates quickly to relieve aches and pains, great for hands-on massage applications on large muscle areas, free of parabens and propylene glycol, and proprietary formula made with USP-grade ingredients.